On National Service Day, Capital Cause hosted the Yes We Can: END ILLITERACY Service Event in partnership with the National Urban League Young Professionals. The service event was endorsed by the 57th Presidential Inaugural Committee and DC Public Schools. Collectively, 500 Young Philanthropists gave 2,000 books to 2,000 to kids attending six DC Ward 8 schools where nearly 70% could not read proficiently. Additionally, volunteers gift-wrapped literacy supply kits, painted literacy murals, organized libraries, created audio books and wrote personal notes to children in the books they purchased for them. 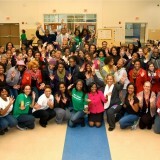 In Turner Elementary the follow organizations served: Capital Cause, NULYP, EST Unity and Young Nonprofit Professiionals Network – DC.